During a recent visit to the Delaware County Board of Developmental Disabilities office on Columbus Pike in Lewis Center, Chris demonstrates how his new smart glasses and braille display works. Can you imagine a world where you were completely dependent on another person to do things for you, take you places, and help you with daily tasks? Chris couldn’t either, and thanks to technology, he doesn’t have to rely on others to be independent. Meet Chris. Chris is a senior at Ohio Dominican University (ODU) double majoring in business and insurance. During his time at ODU, Chris has played drums in the marching band and enjoyed different social activities. In his free time, Chris loves trying different instruments. “There isn’t an instrument I don’t have an interest in,” he said. The piano was the first instrument he learned, but he said it has taken a back seat to the guitar. In what little free time he has left after work, school, and music, one might find Chris working on cars, a hobby he has picked up along the way. As a part of Chris’ job, he helps customers set up their new devices and demonstrates what the products can do. Chris likes being able to use his new braille display to read to himself instead of relying on another person or audio to read aloud to him. So how does the braille display work? Well to those watching Chris’ demonstration, it was pure magic. But Chris would tell you it’s not magic, but rather a quick connection to Bluetooth. 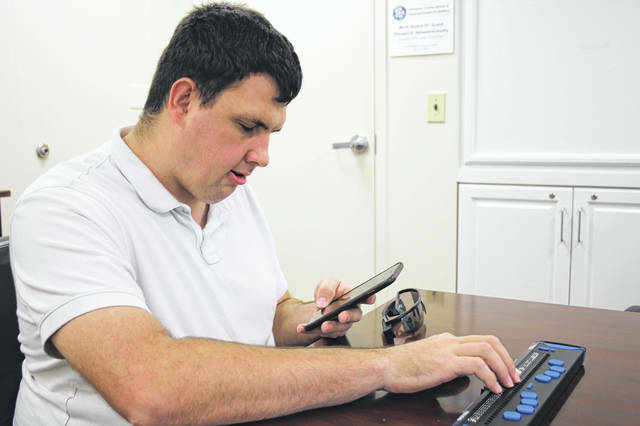 In a matter of seconds, Chris can connect his phone to his braille display and be browsing the web, answering email, and scrolling through social media just like anyone else who is sighted. Chris was asked how technology has changed his life. As someone who is more than familiar with technology, Chris was asked what advice he’d give someone who was hesitant about trying technology. Chris is looking forward to graduating in May and putting his degree to use.